Town Hall Terrace goes the extra mile to make sure your home has everything you need. From your relaxing apartment, town home or patio home to the wonderful surrounding community, Town Hall Terrace provides a wide array of enjoyable amenities, including a fully-equipped fitness center. The fitness center saves you a trip to the gym and gives you full access to cardio exercise and strength training machines. Choose from dozens of different exercises across ten different kinds of machines, with plenty of space and availability for every resident to complete their work-out. Get in your cardio work-out before or after work on the elliptical, exercise bike, treadmill or Stairmaster. Strengthen your muscles with a full line of free weights and two complete weight-lifting machines, as well as an incline bench and bench press. 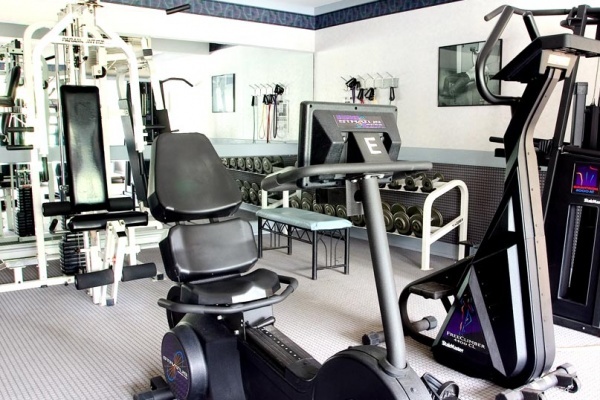 The fitness center is always clean and comfortable, with air conditioning, mounted televisions and a beautiful view. Take a tour of the Grand Island luxury apartments at Town Hall Terrace and see more of the amenities available. Call today to schedule a tour of the grounds and your preferred apartment or townhome.